One of the perks of working in corporate responsibility is getting to think about how really big problems that seem far out on the horizon can be impacted by businesses today. As exciting as it can be to think about our role, it can also seem quite daunting. Listening to the recent Business Forum hosted by the United Nations High-Level Political Forum on Sustainable Development I couldn’t help but be a bit overwhelmed. 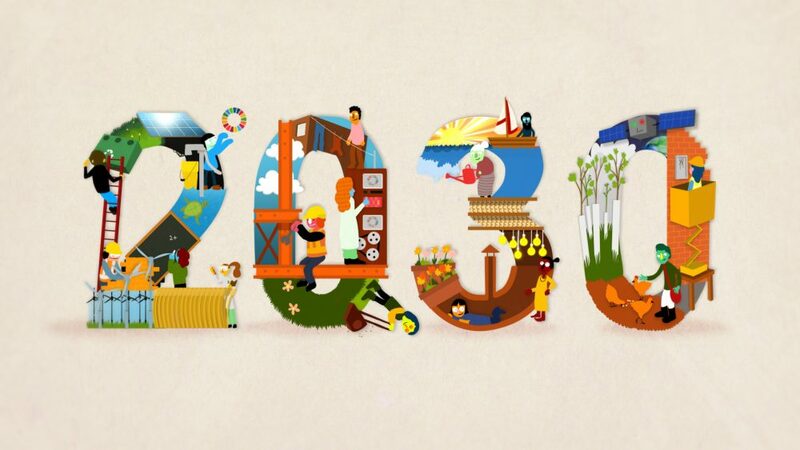 For those unfamiliar with the Sustainable Development Goals (SDGs), they are a set of 17 global goals (and 169 corresponding indicators) intended to move our world forward toward a more just, equitable, and sustainable society by 2030. While statements such as “no poverty” and “zero hunger” are certainly aspirations we all dream about, creating a roadmap that will move governments, societies, and yes, businesses, to that reality can seem daunting. And yet, this is necessary – and we believe Dell has an important role to play. First of all, 2030. That feels far away! As we can see in Dell Technologies’ Realizing 2030 reporting, our days are likely to look quite different in 2030. As a planet, we’re expected to have over a billion more people to care for, as well as the environmental impacts of climate change. As a millennial, I will have more than doubled my work experience by 2030, will undoubtedly be full time “adulting” (should we still consider that a verb in 2030), and will have already experienced and helped shape a third of this century. As a corporate responsibility practitioner, this got me thinking: how can I use the audacious framework and long timeline of the SDGs to move business forward? While this may be the most basic and straightforward use of the SDG framework, it can still be valuable, and likely will be necessary. It is Dell’s expectation that organizations for which the SDGs are particularly relevant will ask their suppliers to report on SDGs-related activities and impact. We know that many companies’ CSR and strategic giving programs already do much to further many of the SDG indicators. As an example, Dell has a wide range of existing programs that show progress to Goal 4: Quality Education. One such program is the Rural Education Action Program (REAP)-Dell CAL program, a computer-assisted learning program aimed to bridge the rural-urban educational divide for students in rural schools across China. The REAP-Dell CAL program is a Dell Youth Learning initiative, and just one example of a Dell program that can help ensure inclusive and equitable quality education for all by 2030. We share a great story about REAP-Dell CAL program here. We expect our customers may ask for information or data in the language of the SDGs, and we must be able to respond. Dell’s Legacy of Good commitments chart a clear course for us toward 2020 and each day brings us closer to achieving the objectives we established for ourselves. You can learn more about our progress on our 2020 Legacy of Good Plan Annual Update web site. While we are proud of the work our Dell team members, partners, and customers have done to date, we recognize that our work is far from complete. As we look toward setting goals for our business for 2030, we can utilize the SDG framework. While we are still deciding the best approach (contribute to as many indicators as possible, design our materiality program and focus on what’s most material to our business based on the SDGs, something else? ), we are excited for the upcoming guidance from our partners at the UN Global Compact (UNGC) and the Global Reporting Initiative (GRI), on the roles, expectations, and opportunities for business in achievement of the SDGs. Even if I was overwhelmed while listening to the speakers at the UN Forum, I was also quite inspired. Many companies talked about the ways they have already used the SDGs to cultivate a corporate business development mindset based around shared value thinking – the unlocking of new markets and new revenue opportunities by addressing social problems. While this is difficult, and must be done mindfully, I believe we have a unique opportunity to pursue these types of programs at Dell in concert with our customers. This would not be done at the expense of our own corporate citizenship of course, but as a way to be even more purposeful in how we innovate. We’ve already started down this path working to measure the net positive benefits of technology solutions and as more companies look to reshape their businesses, we stand ready to be a good partner. And that’s a future I can get excited about. Explore our FY17 Annual update on our 2020 Legacy of Good Plan at legacyofgood.dell.com.